The outer panel of this wallet is folded over itself, with interior ‘hideaway’ pockets hidden inside. 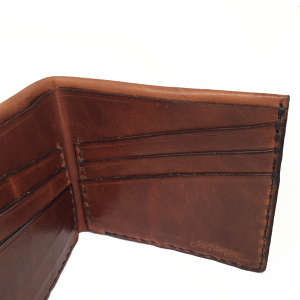 This feature increases functionality and provides a full, finished and durable feel to the wallet. The color of the tobacco leather will patina substantially over time. 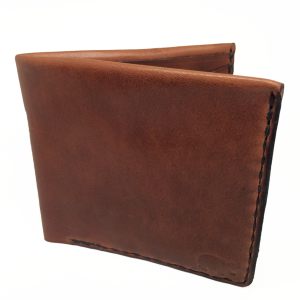 The vegetable tanned leather will absorb oils from your hand, dyes from your blue jeans and character from continual use. This will make your wallet, truly one of kind, and one that you can be proud of for a long time to come.